When it comes to pets; fleas are a troublesome enemy. Though we do our best to protect our cats from coming into contact with fleas; sometimes our efforts fall short and we must find the best way to remedy the situation. Many cat owners dread putting their pets through harsh and often toxic, chemical treatments. But fleas can be a persistent bunch and very difficult to get rid of. What other options are available for cat owners who refuse to use chemicals, and particularly, for owners of older cats who may not be able to tolerate them? It is always easiest to begin with flea prevention. Research shows that giving your cat a daily dose of vitamin B for animals, is a truly effective flea deterrent. There are many holistic pet stores that carry these vitamin B supplements to help keep your cats away from flea infestation. These vitamin B supplements usually taste good, so it’s easy to give to your cat along with their food. But take note: they do take up to 30 days to become an active flea deterrent. If the unfortunate has already occurred, and your cat is infected with fleas, a flea comb available anywhere they sell pet supplies is useful in helping to remove fleas from your cat. Fill a bowl with very hot water, and comb your cat, while immediately dipping the comb into the hot water to kill the fleas. This process will need to be repeated daily until you see a decrease in fleas after combing. During the combing process; begin or continue with the vitamin B supplements. This will aid the process tremendously. Read the labels, but most supplements can be taken twice a day by your cat. 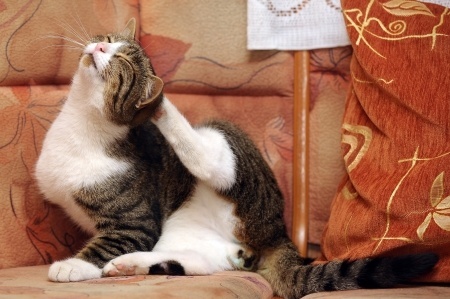 Giving your flea infested cat, rubdowns with a cloth wet with warm water and natural apple cider vinegar is also an effective and natural treatment for fleas. Apple cider vinegar is also good for a cat’s urinary tract health; so if they begin to lick it off after the washing, you don’t need to worry about other adverse health issues. It is perfectly safe. Make sure to wash all sheets, pillowcases, blankets, and towels used on, or by your cat. This gets rid of any fleas who have trapped themselves into the fabric waiting to pounce again. Vacuum and wash the floors with hot water regularly during this time period. You won’t want to finally free your cat from fleas only to attract them again after a couple of days. Washing and vacuuming the floors is a must to kill any fleas hiding in carpets and floorboards. Cats with lower immune systems or other health issues and deficiencies are often more prone to attracting fleas; so a good healthy diet is a must. If your cat has fleas it is crucial to make sure that he or she is receiving the vitamins and nutrients it needs on a daily basis. Less dry kibble and more wet food is best for overall health during this time period. There are many grains in dry commercial cat food that can actually weaken your cat’s immune system. So if your kitty has fleas, and you are in the process of treating him or her; wet food or an all natural and holistic diet is important.